That Carrboro date at the Cat’s Cradle seems to be beckoning me. The day [Saturday] and place is convenient. Why not take in a certainly rare Residents show? Shouldn’t everyone see The Residents at least once, given the chance? We’ll have to muse on this. Until then, one can find out more here. Until I perhaps decide if I want to attend or not [it comes in between two other travel concert dates on my agenda] here’s a fantastic animated gif [possibly the second on PPM, ever] to help you make your own decision, from the Meet The Residents fan site. 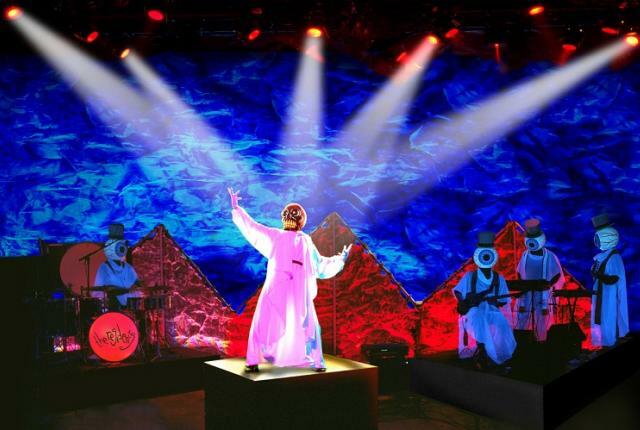 This entry was posted in Live Music and tagged Live Concerts, The Residents. Bookmark the permalink. I had a subscription to Ralph Records which got me a few 7″ singles and EP’s every year in the late between 1978 and approximately 1982. One of my prize possessions from that subscription is a limited release of The Residents take on Satisfaction by The Rolling Stones on “piss-yelllow” vinyl. My fondess for The Residents would ebb and flow over the years, but Ralph Records introduced me to the amazing Snakefinger and Tuxedomoon as well as Yello and MX-80 Sound. When I bought The Resident’s The Third Reich N Roll as a 16 year old, my father decided he should ask me a bit more about what I was listening too, concerned by the album title and graphics. When he found out how far from concerning the messaging was (maybe still concerned about the music) he introduced me to his collection of anti Nazi/anti fascist comics he collected while stationed in Germany in the late 50’s.